When reading in your browser with OverDrive Read, you can define words, take notes, and highlight sections of text. You can see all of your notes and highlights in the menu. To select a word, click or tap and hold the word until the highlighter pops up. Drag the cursor to select more than one word. Click or tap Define to look up the highlighted word in the dictionary. In this panel, you can also look up the word or phrase on overdrive.com, Wikipedia, Google, or Google Translate. Click or tap Search to find other places where the word (or phrase) appears in the book. Click or tap Highlight to see highlighter and note-taking options. Choose between three highlighter colors and select Note if you'd like to write something about the passage. 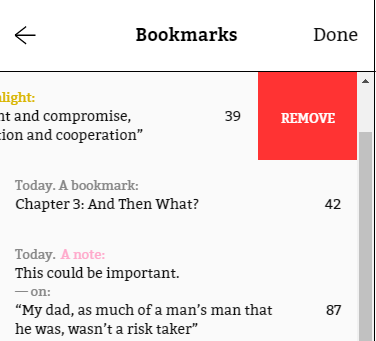 Highlighted passages and notes are saved in the Bookmarks section of the menu. From there, you can select a highlight or note to open that page of the ebook. Note: To open the menu on a mobile device, tap the middle of the screen, then tap the menu icon. To delete an entry, swipe or click-and-drag from right to left on that entry and select Remove.